NAYPYIDAW, Myanmar (Burma), October 21, 2011 (ENS) – Just five days after Myanmar President Thein Sein announced the suspension of the Irrawaddy Myitsone dam construction due to the “will of the people,” local authorities ordered residents evicted to make way for a government-led gold mining operation at the dam site. On September 30, President Sein told Parliament in a letter that he will suspend construction on the Myitsone Dam for the duration of his presidency. The dam was being constructed by China Power Investment to generate power for China. Tang Hpre village is located where the Irrawaddy River arises, at the confluence of the N’mai and Mali rivers in Kachin State. 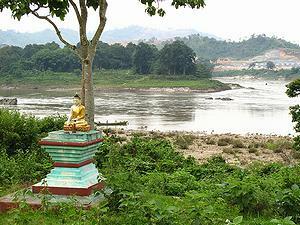 Both of these rivers flow from the Himalayan glaciers of northern Myanmar on its northeastern border with China. The river flows south and empties into the Indian Ocean, creating the Irrawaddy Delta. The Myitkyina Township order clears the way for a joint venture between Mining Ministry No. 2 and the Kha Ka Bo Mining Company to blast river banks, excavate the land, and dredge the Irrawaddy in search of gold. 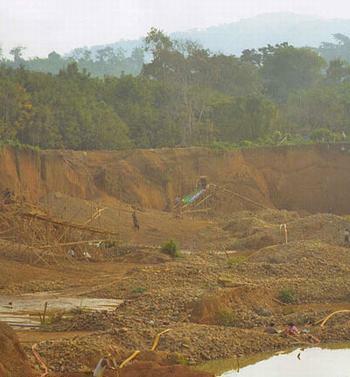 “Unregulated gold mining, often using mercury and cyanide, has been ravaging lands and rivers across Kachin State for several years, causing erosion, alteration of river flows, and toxic pollution,” said the Kachin Development Networking Group in a statement today. “The operation at the Myitsone will destroy the beauty of the confluence and directly pollute the Irrawaddy ecosystem, impacting communities living downstream,” the Kachin group said. “On the one hand the government says it loves the Irrawaddy but on the other hand they’re poisoning the river at its source,” said Ah Nan from Kachin Development Networking Group. After the dam plans were announced in 2006, mining and logging concessions were granted in order to clear the dam site. Large-scale gold mining at the site began in 2010, leaving toxic mercury and cyanide that are used in the mining process to be dumped without regulation into the rivers. The Kachin Development Networking Group warns that the Myitsone dam may go ahead anyway. There is “no evidence on the ground that the dam project has indeed been suspended,” the KDNG said in a statement October 17. KDNG has received reports from villagers in dam construction relocation camps that workers are still operating at the dam site. Ah Nan says there are two relocation camps housing about 1,000 people.